Huzur (aba) stated that yesterday, which was 23rd March, was a key date in the history of the Jamaat as it was the point in history when the Jamaat was established at the hand of the Promised Messiah (as). The Promised Messiah (as) announced that the awaited Messiah and Mahd [the Guided one] prophesied by the Holy Prophet (sa) was fulfilled in his personage. The Promised Messiah (as) further stated that his mission was to establish the oneness of God and the love of the Almighty in the hearts of the people. The Promised Messiah (as) stated that the rank and status he received was due to his veritable and sincere love for the Holy Prophet (sa). Huzur (aba) stated that those people who assert that we consider the status of the Promised Messiah (as) to be greater than the Holy Prophet (sa) (heaven forbid) are guilty of a grave injustice. Huzur (aba) stated that at present, this is the very allegation being used against Ahmadis in Algeria, to the extent that even women with young children are being arrested and taken hundreds of miles away to face prosecution. However, the message I am receiving from those woman is identical, and they all have stated that they have found the unity of God and the true love of the Holy Prophet (sa) through accepting the Promised Messiah (as). Therefore it is not possible for them to retract from it. 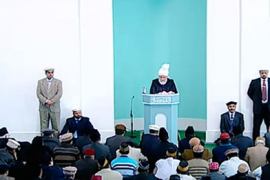 Huzur (aba) stated that whilst we pray for Ahmadis to be relieved of difficulties, we also pray that may God Almighty grant the Muslims the opportunity to accept the ardent devotee of the Holy Prophet (sa). Huzur (aba) then stated that this is the relationship that we must build with God Almighty and this was the standard the Promised Messiah (as) expected from his followers. O Muhammad, you were [like] the pupil of my eye which has been blinded since your demise. Whosoever may depart henceforth, for I feared your death alone. The Promised Messiah (as) stated that while reading this couplet, he wished that it was he who had written these couplets. Those who level allegations against the Promised Messiah (as) that, God forbid, he considered himself superior in rank to the Holy Prophet (sa) cannot even come close to the love the Promised Messiah (as) actually had for the Holy Prophet (sa). Regarding this incident, Hazrat Mirza Bashir Ahmad (ra) Sahib states that the Promised Messiah (as) experienced every kind of difficulty but never expressed his emotions of sorrow or grief on his blessed countenance. However, when it came to the Holy Prophet (sa), he was filled with emotion and tears would flow down from his eyes. There are countless examples in the books and various sayings of the Promised Messiah (as) which illustrate the deep love he had for the Holy Prophet (sa). The Promised Messiah (as) once stated that if all of his progeny were murdered before his eyes and his own hands and feet were cut off and the pupils of his eyes were gorged out, it would not pain his heart as it has been pained by the attack on the noble character of the Holy Prophet (sa). The Promised Messiah (as) did not just merely profess his love for the Holy Prophet by speech alone, in fact every action of his demonstrated the deep love he had for the Holy Prophet (sa). The Promised Messiah (as) said that everything he had attained was due to the Holy Prophet (sa) and by following his noble example. On one occasion he said that he swears by Allah the Almighty that just as God Almighty had spoken to Abraham and then Isaac, Ismael, Jacob, Joseph, Moses and Jesus son of Mary and then the Holy Prophet (sa), upon whom He bestowed His most illumine and pure revelation, in the same way He has bestowed His revelation upon him. However, he said that this is purely due to his subservience to the Holy Prophet (sa). The Promised Messiah (as) also stated that had he not been among the followers of the Holy Prophet (sa) and not followed his noble example then even if his virtuous deeds were as high as a mountain, he would never have been bestowed revelation from Allah the Almighty. After hearing all of this, if someone still levels allegations against the Promised Messiah (as) then this is purely an injustice on their part and done out of foolishness and ignorance. That under the impulse of any passions, he/she shall cause no harm whatsoever to the creatures of God in general and Muslims in particular, neither by his/her tongue, hands, nor any other means. That he/she shall keep himself/herself occupied in the service of God’s creatures for His sake only and shall endeavour towards the beneficence of mankind to the best of his/her God-given abilities and powers. In regards to this, the Promised Messiah (as) stated there are two aspects of faith. Firstly, to believe in the existence of God Almighty and show complete love and devotion to Him. Secondly, to spend all of one’s effort and abilities to serve the creation of God Almighty and treating them with sympathy. In regards to this, the Promised Messiah (as) stated that he would like to inform all the Muslims, Christians, Hindus and Aryas that he did not bear any kind of enmity against anyone. The Promised Messiah (as) also stated that the love he had for the whole of mankind was far more than the love a benevolent mother has for her children. However, his only enemy is the false doctrine which has obliterated the truth. He also that it is his duty to show sympathy to mankind and it was his principal to shun falsehood, Shirk, cruelty, immorality and injustice. Further elaborating on this, the Promised Messiah (as) stated that every species loves its own kind. Therefore, it becomes the duty of one who invites others to God Almighty that he should love them the most. Thus, ‘the Promised Messiah (as) stated that he loves mankind the most and bears no personal enmity with anyone but it is their ill-practises and acts of injustice and cruelty that he despises. Similarly with a bitter opponent of the Promised Messiah (as), Mualvi Muhammad Hussain Batalvi, who had left no stone unturned to ignite flames of hatred all over the country against him, yet the Promised Messiah (as) display compassion to even him. During a court case the lawyer of the Promised Messiah (as) wished to use disparaging words in the questions relating to the family of Maulvi Hussain Batalvi, but the lawyer was strictly prohibited by the Promised Messiah. The lawyer who was a non-Ahmadi said he was astonished that he was trying to weaken the testimony of the opponent yet the Promised Messiah stopped him due to his high moral standards. It is the teachings of the Promised Messiah that enable all Ahmadis to never deviate from high moral standards even when faced with opposition. If only people understood that the Promised Messiah and Imam Mahdi has arrived and that the mission of spreading Islam will only be achieved through his community – and not through swords, weapons or force or by killing innocent people. We will only win the hearts of people and not win over territories and land. Atrocities are occurring in Europe in the name of Islam by either individuals or groups. In London a few days ago innocent people were attacked and killed in the most barbaric and cruel fashion. People simply walking on a street were mowed down by a car and a policeman was also murdered. All of this has happened because the so called Muslim scholars have led people astray. Rather than instill them with the beautiful teachings of Islam, they infuse them with thoughts of cruelty and barbarity. Huzur said as he has said often before as well, in this situation it is the task of an Ahmadi to display the beauty of Islam before the world. Huzur ended by quoting the Promised Messiah who said the false belief that Jesus son of Mary will physically descend from the heavens will soon be shunned by Christians and Muslims. Eventually people will realise that this will never occur. The Quran states that all Prophets without exception were mocked. If Jesus were to literally descend from the heavens with the support of angels, who would mock him? [because it would be completely obvious to all if someone descended literally from the sky]. The Promised Messiah however was mocked by all yet it did not and never has hindered his mission. The Promised Messiah said that three centuries will not have passed from the time he was writing this, when Christians and Muslims will rid themselves of this false concept relating to the son of Mary and there will remain only one true religion. The Promised Messiah only came to sow the seed, and he said you will see this seed grow and flourish. Huzur said we see today how this seed has flourished and reaped fruit and has become a luscious tree.